Smoking changes the skin, teeth, and hair in ways that can add years to your looks. It also affects fertility, the strength of your heart, lungs, and bones. The distinctive characteristics of a smoker's face, that generally make people look older, are referred to as "smoker's face". Lines or wrinkles on the face, typically radiating at right angles from the upper and lower lips or corners of the eyes, deep lines on the cheeks, or numerous shallow lines on the cheeks and lower jaw. A subtle gauntness of facial features with prominence of the underlying bony contours. Early smoker's skin changes show as slight sucked in cheeks. In some cases these changes are associated with a leathery, worn, or rugged skin texture. A thin skin which gets a slightly pigmented grey appearance over time. Tobacco smoke exposure decreases capillary and arteriolar blood flow, possibly damaging connective tissue that helps maintains healthy skin. The cells that form collagen and elastin the building blocks of the skin are also damaged by cigarette smoke. Tobacco smoke is phototoxic, and its toxicity increases in the presence Of UV rays from the sun, causing double the damage to skin cells. Smoking can lead to the skin getting fewer nutrient supplies and increasing the build of toxic waste products in it. Aging – There are more than 4,000 chemicals in tobacco smoke, and many trigger the destruction of collagen and elastin – fibers that give skin its strength and elasticity. Smoking or even being around smokers degrades the building blocks of the skin resulting in sagging skin and deeper wrinkles. The nicotine in the cigarettes causes blood vessels to constrict, weakening the supply of blood to the outer layer of the skin. Pale skin tone and colour – Smoking deprives the skin of oxygen and nutrients. So some smokers appear pale, while others develop uneven skin color. Age spots or blotches of darker skin color are common on the face and hands. While anyone can develop these spots from too much sun, research suggests that smokers are more susceptible. Smoking can also lead to a condition called telangiectasia, characterised by fine red lines in the skin caused by dilation of small blood vessels. While holding a cigarette between your fingers may look fashionable, over a period of time your fingernails and the skin surrounding it gets stained by the tobacco and so do the teeth. The good news is that these stains tend to fade when you quit smoking. Low moisture content – Smoking reduces the skin's moisture as well as Vitamin A which is required for neutralising free radical damage. This eventually causes skin dryness. Poor wound healing – Smoking decreases the ability of the skin to regenerate and repair wounds. Nicotine, one of the toxic components of tobacco smoke causes blood vessels to contract, reducing the nutrient supply to the body necessary for skin regeneration. Carbon Monoxide is another toxic tobacco smoke component that reduces oxygen flow through the body, causing a build-up of toxic waste, thus preventing damaged cells from regenerating. Lines around the lips – Smoking affects the area around the mouth. Firstly, it creates "the smoker's pucker", as smokers use certain muscles around their lips that give them dynamic wrinkles that non-smokers do not have. Secondly, there is a loss of elasticity. Both these factors lead to deep lines around the lips. Eye wrinkles (crow's feet) – Eventually everyone gets wrinkles on the outside of the eyes, but these wrinkles develop earlier and go deeper among smokers. Heat from burning cigarettes and squinting to keep smoke away from the eyes contribute to visible crow's feet. Meanwhile, chemicals from inhaled tobacco cause internal damage to the skin structures and blood vessels around the eyes. Psoriasis – Psoriasis is a chronic condition that most often causes thick, scaly patches on the skin – – usually on the knees, elbows, scalp, hands, feet, or back. The patches may be white, red or silver. Recent studies suggest smokers are at greater risk of developing psoriasis. 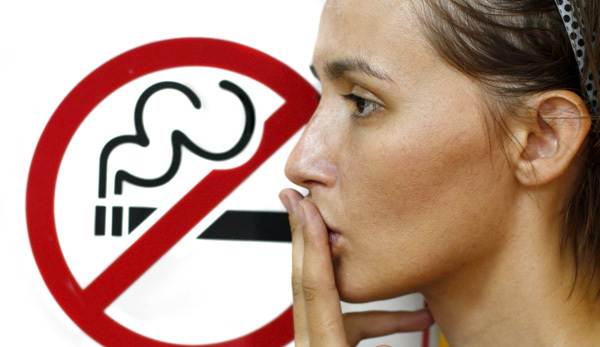 Stop smoking – Quitting smoking is one of the best ways to improve skin damaged by smoking. As the blood flow improves, your skin receives more oxygen and nutrients, helping you develop a healthier complexion. Maintain a skincare routine – Once you quit smoking; the skin becomes more resistant to premature aging. Wrinkles and age spots, caused due to smoking, can be reversed by the use of creams containing topical retinoid and antioxidants such as Vitamins C and E. Sunscreen should also be used every day. Use oral antioxidants – These can help limit the damage caused by smoking. Observe the tobacco-free effect – Staying away from tobacco will also reduce the stains on your fingers and nails; teeth may get whiter.